Chromatin adjoining the site of integration of a transgene affects expression and renders comparisons of closely related transgenes, such as those derived from a BAC deletion series retrofitted with enhancer-traps, unreliable. Gene targeting to a pre-determined site on the chromosome is likely to alleviate the problem. A general procedure to replace the loxP site located at one end of genomic DNA inserts in BACs with lox66 is described. Truncating insert DNA from the loxP end with a Tn10 transposon carrying a lox66 site simultaneously substitutes the loxP with a lox66 sequence. The replacement occurs with high stringency, and the procedure should be applicable to all BACs in the public domain. Cre recombination of loxP with lox66 or lox71 was found to be as efficient as another loxP site during phage P1 transduction of small plasmids containing those sites. However the end-deletion of insert DNA in BACs using a lox66 transposon occurred at no more than 20% the efficiency observed with a loxP transposon. Differences in the ability of Cre protein available at different stages of the P1 life cycle to recombine identical versus non-identical lox-sites is likely responsible for this discrepancy. A possible mechanism to explain these findings is discussed. The loxP/lox66 replacement procedure should allow targeting BACs to a pre-positioned lox71 site in zebrafish chromosomes; a system where homologous recombination-mediated "knock-in" technology is unavailable. Expression of a transgene integrated into the germline of an animal is influenced by i) variation in copy number of transgene and ii) the effect of chromatin adjoining the site of integration . Thus expression comparisons of closely related transgenes, such as those derived from a BAC deletion series retrofitted with enhancer-traps , become unreliable. Targeting transgenes to the same site on the chromosome alleviates the problem, and both "knock-in" technology using homologous recombination  and insertion of cDNA plasmids into a loxP site have been used in previous studies . Because the lox-Cre recombination reaction/equilibrium favors excision, mutant sites such as lox66 and lox71 have been constructed to stably incorporate small plasmid DNA into chromosomes of plants and mouse ES cells [4, 5]. BACs have not been used similarly, presumably because altering the loxP or lox511 sites flanking insert DNA in BACs is challenging. We describe a general procedure that readily overcomes this particular hurdle of converting a loxP to a lox66 in BACs. Mutant lox sites generated over the years [4, 5, 10–15] are of two categories: i) mutations in the 8 bp asymmetric spacer and ii) mutations in the 13 bp inverted repeats (Figure 1). The 8 bp spacer region is thought to form Holiday-like structure with perfect base pairing required during the recombination process. Single nucleotide differences in spacer of two lox sites render recombination between them very inefficient [10–13, 16]. Nevertheless varying degrees of promiscuity in recombining different spacer-mutant lox sites have been reported; using both partially purified Cre-extracts in vitro[10, 11, 14, 15], and Cre over-expressed in cells [12, 13, 15, 17]. High levels of stringency in vivo can be achieved however with Cre protein expressed from its native source namely, a phage P1 infection [7, 16]. Schematic diagram for replacing loxP with lox66 in BACs. A set of mutant lox sites is shown in the top panel, with the mutant nucleotides shown in green. The inverted repeats are underlined. The bottom panel sketches our strategy to convert a wild type loxP to a lox66 mutant site in BACs while making end-deletions of genomic DNA insert from loxP end. Nucleotide substitutions in the 13 bp inverted repeats (palindromic arms) appear not to severely limit its recombination with a wild type loxP sequence, and this tolerance increases for substitutions towards the outer ends of these inverted repeats . Cre protein binds to these 13 bp palindromic arms to recombine two lox sites [18, 19], and the protein-protein interactions between Cre molecules appear to compensate for possible distortions in Cre binding to mutant-arm DNA. Wild-type loxP and the arm-mutant lox66 have identical spacers, and recombine well with Cre . We used this rationale to substitute a lox66 for the wild-type loxP site in BACs while truncating the insert DNA using a lox66 transposon (Figure 1). While cross recombination between loxP and lox511 had been reported to occur at efficiencies ranging from 5 to 100% in a variety of settings that expressed Cre constitutively [11–13, 15, 17], it was determined to be no more than 0.5% in our BAC end-deletion procedures where Cre protein is generated by a phage P1 infection [7, 16]. The possibility that phage P1 infection-derived Cre protein in our procedures might prove too stringent to allow efficient recombination between loxP and lox66, despite the fact that lox66 is an arm mutant and not a spacer mutant like lox511, was explored first by testing the ability of phage P1, carrying wild type loxP, to transduce a plasmid containing a lox66 site . E. Coli with small plasmids carrying one of several mutant lox sites and a gene conferring resistance to an antibiotic were each infected with phage P1. The P1 lysates were used to infect fresh bacteria, and plated on LB agar containing the antibiotic whose resistance gene was carried by the plasmid . The results are shown in Table 1. The results indicate that phage P1 can transduce a lox66 plasmid just as efficiently as a wild type loxP plasmid (compare rows 1 & 2 with 4 in Table 1). However, phage P1 was unable to transduce plasmids with the spacer mutants lox511, lox5171 and lox2272 (mutants described in references 10 and 11), and these were used as negative controls in the experiment (rows 3, 7 & 8). The data shown are from two independent experiments. Note that both the lox "arm mutants", lox66 and lox71, are efficiently transduced, while all of the "spacer mutants", lox511, lox2272 and lox5171 are not (compare rows 1, 2, 5, 6 with 3, 7, 8). There was a quantitative difference between lox511 and lox5171 or lox2272: while the latter two produced zero colonies on both runs, the lox511 produced 2 and 4 colonies in the two experiments. The results are in line with earlier findings [16, 7, 5], although the high efficiency of transducing lox66 and lox71 plasmids by wild type loxP in phage P1 under our more stringent lox-Cre recombination conditions was surprising. Having demonstrated efficient cross recombination between lox66 and loxP using phage P1 derived Cre protein, we tested the lox66 transposons to generate end-deletions of insert DNA in BACs. The following lox66 markerless transposon plasmids, similar to our other markerless transposons reported earlier [20, 7], were constructed (Figure 2). Schematic representation of the two lox66 transposons constructed. Both use the same framework of markerless transposons with loxP or lox511 [20, 7]. The enhancer-trap is adapted from . End deletions of genomic DNA in BAC clone C was made with pTnLox66(B)markerless transposon (Figure 2, top panel) exactly as described earlier with loxP markerless transposons [20, 7, 2]. DNA isolated from a set of deletions is shown in lanes 3-11, Figure 3A. Note that inversions of BAC DNA resulting from transpositions of lox66 in the opposite orientation to that in the BAC vector (schematic in Figure 3B) are not recovered because the starting BAC clones are larger than P1-headful length . FIGE analysis of BAC DNA isolated from deletions generated with lox66 transposons: Panel A: The BAC DNA was digested with Not I prior to FIGE. Lane 1 shows DNA from starting BAC-C. Lanes 3-5 and 7-11 display DNA from BAC deletions generated by Cre-recombination of lox66 with loxP using transposons pTnLox66(B)markerless and pTnLox66(B)markerless Enhancer-Trap transposon, respectively. Lane 6 shows DNA from a loxP-Cre independent internal deletion. Lane 2 shows a 5 kb ladder. The vector DNA bands generated with Not I a, b, c, are indicated by the arrows to the left. Size of vector bands b and c are consistent with loxP-Cre dependent recombinations, while vector band a arises from starting BAC-C or from an internal deletion in BAC-C. DNA from BAC deletions made with pTnLox66(B)markerless transposon generated the Not I vector band of the expected size (~6.6 kb) shown in lanes 3-5 of Figure 3 (marked by arrow c). The BAC deletion shown in lane 6 arises from an internal deletion in the genomic insert DNA, and is independent of lox-Cre recombination. The vector DNA band upon Not I digestion of this clone is 10.6 kb in size, and is identical to that of starting BAC clone C (displayed in lane 1, Figure 3A and marked by arrow a). This vector DNA band serves as a characteristic identifying feature for internal deletions , and can comprise ~90% of isolates in end-deletions made with certain BAC clones (PKC unpublished observations). These arise due to recombinogenic sites in insert DNA (discussed in ). Panel B: A schematic representation of the Not I sites in pTARBAC2.1 vector DNA in BAC clones is shown. Panel C: Location of ends of lox66 substituted deletion clones in lanes7-10 on zebrafish chromosome 9 is indicated. These were obtained by BLAST analyses of the BAC end sequences derived with Seq 1 primer [Additional File 1] with the zebrafish genome sequence. End-deletions of insert DNA in a different BAC clone D with pTnLox66(B)markerless Enhancer-Trap transposon (schematic in lower panel of Figure 2) is displayed in lanes 7-11 of Figure 3, panel A. 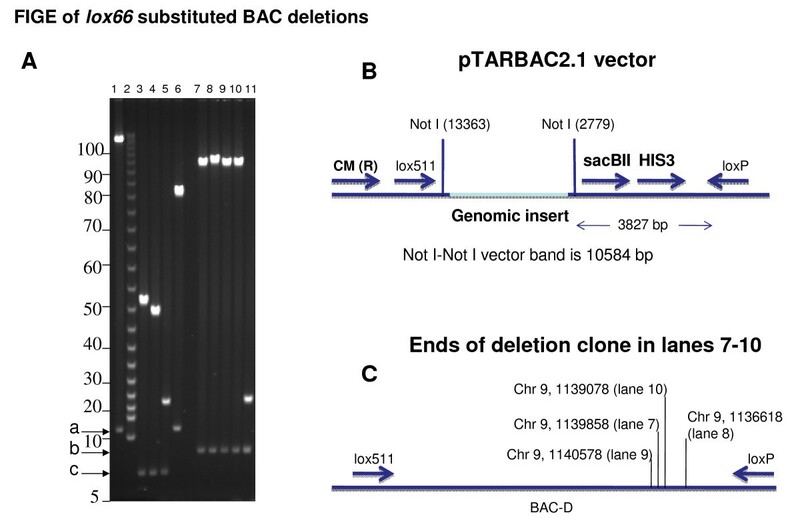 Not I sites in pTARBAC2.1 vector DNA in BAC clones is shown in panel B. Note that the 3827 bp of DNA between loxP and the Not I site at 2779 is replaced during recombination of transposed lox66 and loxP in BAC vector. Thus in deletions with the pTnLox66(B)markerless transposon the BAC vector band obtained with Not I digestion is ~6.6 kb (see lanes 3-5 of Figure 3A). Deletions with pTnLox66(B)markerless Enhancer-Trap transposon results in a Not I vector DNA band larger by 1.5 kb, (lanes 7-11 Figure 3A), due to the Not I site being further away in the enhancer-trap (see lower panel of Figure 2). BAC insert DNA sequencing with the transposon based primer Seq 1  indicates DNA size in deletions shown in lanes 7-10 are all slightly different despite their inadequate resolution in the FIGE (Figure 3A). This is indicated in the schematic diagram in panel C of Figure 3, and the actual sequences included in [Additional File 1]. Progressive end-deletions using the lox66 transposons were generated at an overall efficiency of 10-20% of that obtained with the wild type loxP transposons, depending on whether other recombinogenic sites existed in the genomic DNA insert of the BAC clone. For example, efficiency was at the lower end of ~10% with BAC clone C; which consistently generates a large percentage of lox-Cre independent internal deletions. As much as ~40% of clones isolated comprise internal deletions of that particular size shown in lane 6, Figure 3A, when a wild type loxP markerless transposon is used. Note that lox-Cre independent internal deletions of genomic insert are readily isolated here because there is no selection for transposition itself in these markerless transposons, only selection for deleting insert DNA to less than P1 headful packaging capacity (see  for discussion). End-deletions with the lox66 transposons approached ~20% with a different BAC clone D, containing APPb gene sequences from a different region of the chromosome. BAC-D produces far fewer internal deletions (not shown). The lower efficiency of generating end-deletions with either of the two lox66 transposons is in sharp contrast to the transduction experiments with phage P1, displayed in Table 1, where no difference was observed between wild type loxP and lox66 carrying plasmids. The DNA from BAC deletions generated with the two lox66 transposons was sequenced with primers complementary to the transposon end (see  for details). These are seq 1, and seq 4-compliment for deletions made with pTnLox66(B)markerless transposon, and seq 1 and LF8-compliment for deletions made with pTnLox66(B)markerless Enhancer-Trap transposon. 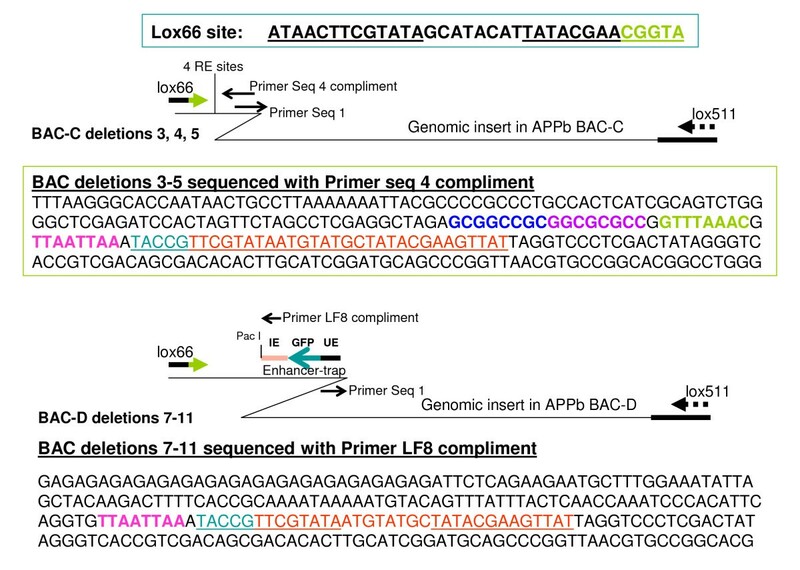 While primers Seq 1 and Seq 4 have been described earlier , primer LF8-compliment was designed from within the intron enhancer of Amyloid Precursor Protein (APPb) gene . The results are shown schematically in Figure 4. BAC deletions generated with lox66 transposons pTnLox66(B)markerless and pTnLox66(B)markerless Enhancer-Trap sequenced with Primers Seq 4-compliment and LF8-compliment respectively. Top Panel: Sequence of BAC-C deletions 3, 4, 5, is shown. The four restriction enzyme sites (4 RE sites) indicated in the schematic representation are Not I, Asc I, Pme I and Pac I, and correspond to sites in pTnLox66(B)markerless transposon shown in Figure 2 top panel. These sites are highlighted by different colors in the sequence presented. Bottom Panel: Sequence of BAC-D deletions 7-11 obtained with pTnLox66(B)markerless Enhancer-Trap transposon is shown. The Pac I site is highlighted in color. Sequence complimentary to the lox66 site is colored and underlined in both panels. Sequencing in the opposite direction with transposon end-based primer Seq 1 in deletion clones 3-5 and 7-11 indicates zebrafish DNA which BLASTs to chromosome 9 (not shown). The locations of these sequences on Chr 9 are consistent with end-points of the BAC deletions expected from their sizes on the FIGE gel shown in Figure 3. The Seq 1 primer sits 38 nucleotides from the transposon end, and sequences generated with it read outward into the genomic insert DNA (9). 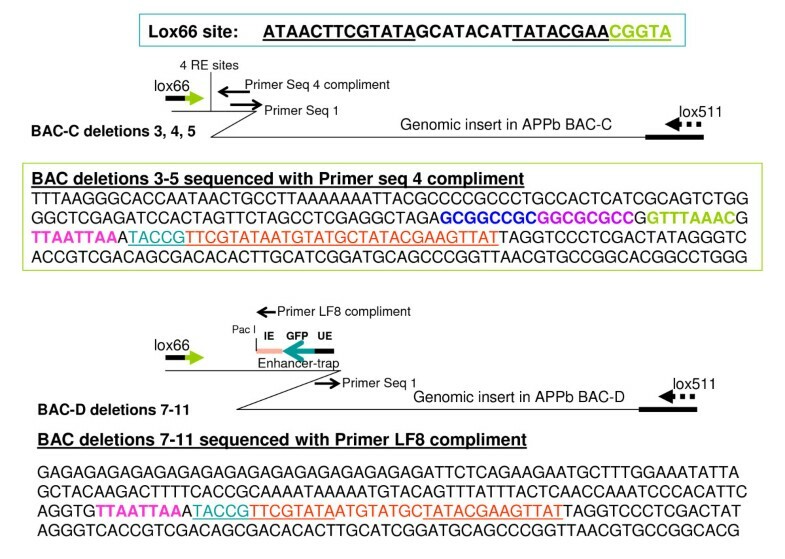 Sequencing BAC deletions displayed in lanes 3-5 and 7-11 of Figure 3A with Seq 1 primer indicate that progressive truncations have occurred from the loxP end of genomic insert DNA in each of these clones from starting BACs C and D respectively. BLAST analyses of these sequences determine the deletion end points (shown in Figure 3C), and are consistent with their mobility on FIGE. Sequences of BAC deletions obtained using either Seq 4-compliment or LF8-compliment read in the opposite direction, as indicated in Figure 4. The results clearly demonstrate that the loxP site in the parent BACs have been replaced with lox66. The sequences in Figure 4 also indicate that restriction enzyme sites in the starting transposon have been preserved in the BAC deletions (compare restriction sites in Figures 2 and 4). We describe a general approach to replace the wild type loxP sequence located at one end of genomic DNA inserts in all public domain BACs with a lox66 site. The procedure uses a lox66 transposon to trim insert DNA from the loxP end and simultaneously replace the original loxP with a lox66 site. Replacement of loxP with lox66 occurs with high fidelity. Although the genomic DNA insert is truncated in the process, the size of insert DNA remaining in the lox66 BAC can be as large as 105 kb, the limit encountered by the ~110 kb packaging capacity of the P1 phage head. The resulting 105 kb insert DNA size, the remainder being BAC vector, is unlikely to be a drawback in most applications; because a majority of vertebrate genes can be housed in their entirety within this size limit: more than half of non-coding gene-regulatory sequences in vertebrates are located within this span of DNA adjoining start sites of genes . Therefore lox66 BACs housing entire genes in their chromosomal contexts can now be stably integrated to pre-positioned lox71 sites in chromosomes using Cre recombination as described earlier for small plasmids [4, 5]. The fidelity of substituting lox66 for loxP in BACs is high: No truncations occurred from the lox511 side of genomic DNA insert in our experiments using the lox66 transposons. This should have been easy to detect because a different sized vector DNA band would have been generated upon Not I digestion of the DNA (see Figure 3B). The high fidelity of recombination observed in the loxP site substitutions is consistent with the transduction experiments described here (compare rows 1, 2 and 5, 6 with row 3 in Table 1) and with earlier studies using P1 phage-generated Cre protein [7, 16]. The results shown in Figures 3 and 4 indicate that additional changes, such as incorporating enhancer-traps  or other reporter and/or selectable marker genes can readily be made in the lox66-BACs during the substitution process. The methodology should facilitate targeting functionalized lox66-BACs to a pre-positioned lox71 site on the chromosome to generate transgenic animals. The approach should be of special interest in systems, such as zebrafish, where "knock-in" technology using homologous recombination are un-available due to genome duplication in an ancestral teleost . Targeted integration using this strategy has been reported recently in zebrafish; but only to integrate small lox66 plasmids to lox71 sites on chromosomes . Targeting loxP plasmids to vertebrate genomes can be affected both by the DNA topoisomerase activity of Cre protein and cryptic lox sites in chromosomes [24–27]. The topoisomerase activity of Cre is unavoidable, and might explain the low efficiency of integrating small lox66 plasmids to chromosomal lox71 sites in zebrafish . Cryptic lox sites are also likely to reduce efficiency, although integration at those sites is expected to be less efficient than at authentic lox71 sites. Despite these potential complications, targeting of small lox66 plasmids to a lox71 site has been successful in zebrafish , plants  and mouse ES cells [5, 3], and therefore lox66 BACs should be targetable in a similar manner. 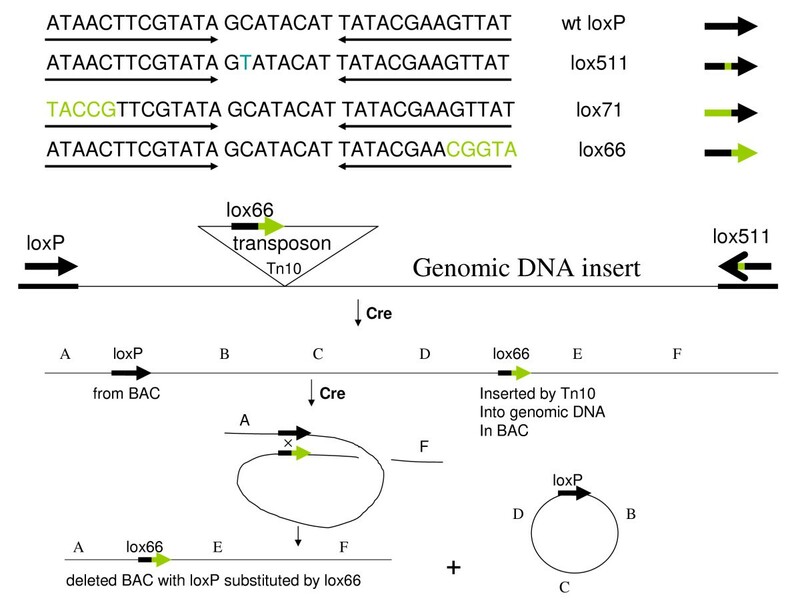 We believe using a lox66 transposon to substitute the loxP site in BACs should be easier than using homologous recombination in E.coli because the same lox66 transposon can be used with all BACs in the public domain. Recombineering approaches on the other hand require building at least one arm of homology for each BAC [28–30]. Additional alterations to the BAC are easy to incorporate with lox66 transposons, but difficult otherwise. 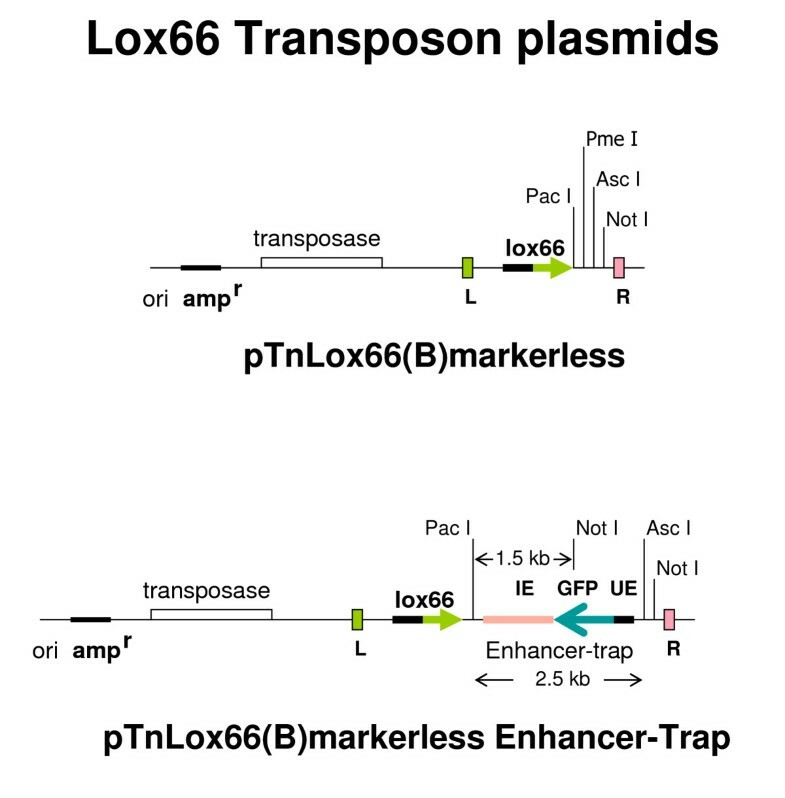 The overall efficiency of making end-deletions with the lox66 transposons is 5-10 fold lower compared to loxP transposons, despite there being no difference between the two in phage P1 transduction of plasmids containing either site. This was puzzling. The BAC end-deletion procedure can be broken down into three discrete Cre-mediated recombination steps (shown schematically in Figure 5), namely 1) creating the lox66-loxP deletion in BAC after the lox66 site transposition, 2) generating the co-integrate between deleted lox66- BAC and P1 phage, and 3) circularizing the linear BAC DNA packaged in the phage head upon re-entering fresh bacteria (see references 16, 20 for details). Each of these steps requires Cre recombination between loxP and lox66 sites. While steps 2) and 3) are common to both P1 transductions and BAC end-deletion procedures, step 1) is unique to the latter. Note also that steps 1) and 3) most likely occur during the early stages of the P1 infection, with lower levels of Cre protein around, while step 2) occurs late in infection with probably higher levels of Cre protein in the cell. It is tempting to speculate therefore that step 1) is likely to be more stringent than step 2), and might discriminate between loxP and lox66 sites so as to slightly disfavor the loxP-lox66 compared to a loxP-loxP recombination. Thus fewer truncations are likely to occur with lox66 inserted into the genomic DNA; resulting in fewer BAC inserts capable of packaging both the lox66 and loxP sites within the same phage head that ultimately allows them to be circularized in the next round of infection [16, 20]. Such rationalization would also require that a similar discrimination in step 3) is not enough to lower survival of the truncated linear BAC DNA flanked by loxP-lox66 within phage P1 heads through circularization. A delay in degradation of the linear DNA upon entry into the cell might be sufficient to overcome this discrimination. Also other recombinases in the cell might help out in the process of circularization, as noted earlier . Loss of stringency of lox-Cre recombinations with higher levels of Cre protein, proposed for step 2), is most likely responsible for the wide range of promiscuity observed in previous studies where Cre was expressed constitutively in cells or used in vitro[11–15, 17]. A schematic representation of the three Cre-recombination steps in the end-deletion/ lox66 substitution process. Step 1 shows the end-deletion of genomic insert DNA by the transposed lox66 site recombining with the loxP endogenous to the BAC clone. Step 2 illustrates co-integrate formation between lox66 APPb BAC and P1 phage DNA carrying loxP. 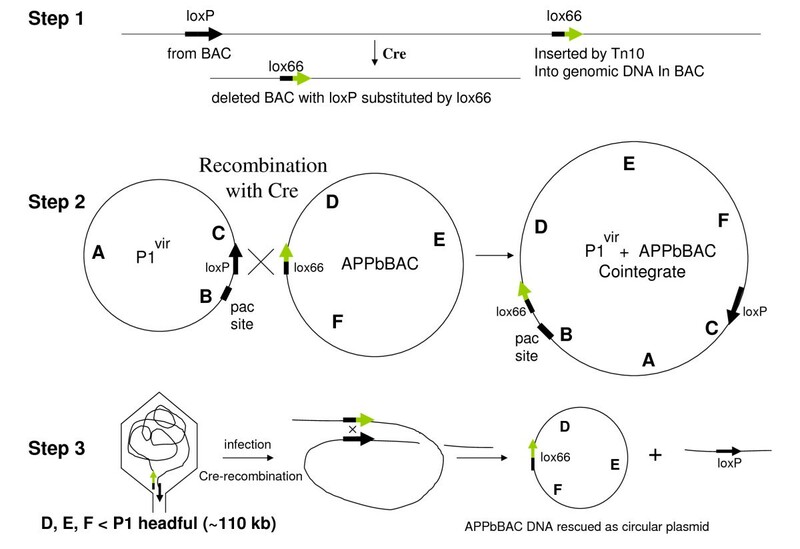 Step 3 shows regeneration of circular lox66 BAC from the linear DNA in the phage head after infection of fresh bacteria. The lox511 site at the other end of genomic insert DNA is omitted for clarity purposes, as it does not play any role in Cre recombinations with either lox66 or loxP. Note that the relative position of the two lox sites in the linear DNA inside the phage head determines whether lox66 or loxP is retained in the BAC. This in turn is determined by the location of the "pac site" in the co-integrate shown in Step 2 (see [16, 20], for detailed discussion). Several interesting conclusions can be drawn from considering the asymmetry of the lox-Cre recombination reactions involved in the substitution process. There is directionality to the loxP site arising from the 8-base asymmetric spacer. Cre-recombination of identical spacer lox sites occur readily, mutant or otherwise, while those between non-identical spacers is severely restricted [16, 7]. Thus substitution of the lox511 site at the other end of insert DNA in BACs with lox66 is likely feasible when it also carries the same spacer mutation as lox511. The directionality of the lox-Cre recombination should also prevent substitution of lox71 for loxP in BACs: because the arm mutation in lox71 is on the rear end of the arrow shown in Figure 1 (top panel), the Cre recombination after transposition of a lox71 site into genomic DNA would result in lox71 ending up in the deleted portion of the genomic insert (see bottom panel of Figure 1). However, transduction of plasmids carrying lox71 by phage P1 is not affected by this asymmetry: the lox71 site should end up in segment F-C of cointegrate rather than segment B-D as in the case of lox66 (refer to Step 2 of Figure 5). The linear DNA in the P1 phage head should then be flanked by loxP at left and lox71 on right, respectively (Step 3 of Figure 5). Upon Cre-recombination this DNA should be able to circularize with lox71 in the BAC and loxP in the small linear piece of DNA from the termini (step 3 Figure 5). The lower efficiency of end-deletions with lox66 compared to loxP transposons should not pose a hurdle because several thousand deletion clones are generated in each deletion/substitution experiment, and one can screen a sufficient number of clones to obtain the desired number of lox66 substituted BAC deletions. Using this end-deletion/substitution procedure, BACs as large as 110 kb with loxP replaced by lox66 can be generated with minimal effort using the same lox66 transposon for all BACs in the public domain. We thank Dr. Faye Calhoun, Cheryl Harrington, Rosalind Grays, Connie Key and Kara Battle, for support and encouragement. This work was supported in part by MBRS-SCORE grant # SO 608049 from the NIGMS, and EXPORT grant #1P20 MD00175-01 from the NIH and funds from the North Carolina Biotechnology Center. PKC carried out the design of experiments, lox66 transposon retrofitting of BACs, analyses of data and writing of manuscript. LAS, NS, VLR and TLM screened BAC deletion libraries using FIGE, end-sequencing of lox66 substituted BACs and bio-informatic analyses of data. KRH helped with writing, provided critical evaluation of scientific content of manuscript and helped with funds. All authors read and approved the final manuscript.